Chinese PLA Gen. Guo Boxiong and colleague Gen. Xu Caihou are most guilty of being politically incorrect. 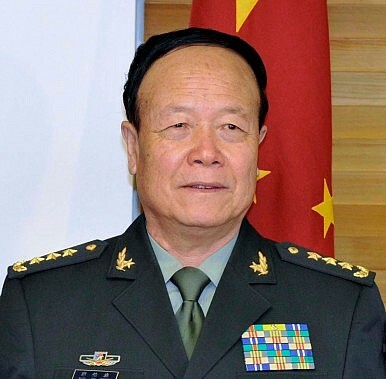 China Central Television (CCTV) on April 26 reported a summary of corruption charges leveled against former Central Military Commission (CMC) vice chairman Gen. Guo Boxiong. In a surprising analysis, the official Chinese People’s Liberation Army (PLA) website claimed that Guo, along with his fellow former CMC vice chair Gen. Xu Caihou, were most blameworthy not for their corruption, but for violating Communist Party of China’s political bottom line. On October 30, 2014, Xi personally convened an all-military political work meeting at Gutian in Fujian Province at which he announced that the PLA’s goal must be the realization of the China Dream, the great rejuvenation of the Chinese people. The PLA website seems to indicate that this is the political line that Guo violated. During their tenure on the CMC, Guo and Xu were joined in 2010 by a third, more senior vice chair, Xi Jinping, whose presence as senior vice chair at the time signified his status as future CMC chairman, Party general secretary, and state president. Could Guo and Xu have known that Xi’s assent would herald their own downfall? According to Japanese media, Xu’s corruption investigation began March 15, 2014 and he lost his Party membership on June 30 that year. Guo’s investigation on identical charges began April 9, 2015, losing his Party membership on July 30, about a year and a month after Xu. Loss of membership is the Party’s equivalent of damnation, placing the condemned in an isolated state from which there is no return. For example, Deng Xiaoping’s ultimate rehabilitation and ascent to power were secured by Mao’s refusal to rescind his Party membership. Xu was junior to Guo, so his removal might have been less difficult than Guo’s. It may even have paved the way for Guo’s prosecution, suggesting that perhaps even bigger fish will fry in the near future. Within Hu Jintao’s PLA, however, Guo was the top officer, and the previous removal of other higher-level figures such as Zhou Yongkang and Ling Jihua leave it open as to who might be next. CCTV reported that after stripping Guo of Party membership, the People’s High Procuratorate referred his case to the Military Procuratorate, which discovered that Guo received massive bribes both personally and through family members in exchange for supplying promotions and assistance. The bribery amounts were massive, factually certain, and evidence complete and compelling. Faced with these charges Guo confessed to everything, although his case has not yet gone to trial. Were Guo’s crime corruption alone, we might assume that his was simply a case of a corrupt military officer brought to justice. The PLA website’s insistence that his greatest crime was in fact supporting a politically incorrect line resonates on several other levels. First, it is an affirmation of the primacy of politics and of Party control of the military (and perhaps hints at political persecutions of the Mao era). For those who question the strength of this control, the fact that Xi was able to remove the generals suggests that it is intact. It also suggests that whatever objective crimes a person may have committed are less important than their political standing, namely their standing within the Party and in particular with Xi Jinping. Given Xi’s apparently strong hold over the military, his need to assert it shows dissatisfaction with the current state of affairs. I suspect that Xi is following Deng’s model of using political force to realize a program of PLA reform. Guo Boxiong is the latest PLA 'tiger' to fall to Xi's anti-corruption campaign.